Radial Flow 6" Electric Submersible Pump Performance Chart Rp 2½ Pump Type Oil filled Water filled Dimensions & Weights of Pump with Water filled Motor Length (mm) Type Pump + Motor ØE = For Single Cable Motor Maximum Diameter of Pump Inclusive of Cable Guard. ØE = For Two Cable Motor Maximum Diameter of Pump Inclusive of Cable Guard Will ØE = Increase by 3mm. Radial Flow 6" Electric Submersible Pump Performance Chart Rp 2½ Pump Type Water filled ØE = For Single Cable Motor Maximum Diameter of Pump Inclusive of Cable Guard. ØE = For Two Cable Motor Maximum Diameter of Pump Inclusive of Cable Guard Will ØE = Increase by 3mm. 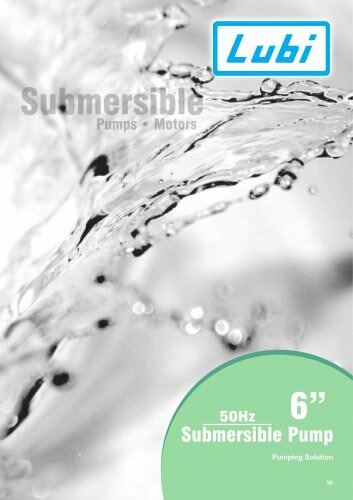 Radial Flow 6" Electric Submersible Pump Performance Chart Rp 2½ Water filled Motor Type Pump Type Dimensions & Weights of Pump with Oil filled Motor Type Pump + Motor N50A/8 + H4540-T N50A/9 + H4540-T N50A/10 + H4555-T N50A/11 + H4555-T N50A/12 + H4555-T N50A/13 + H4575-T N50A/14 + H4575-T N50A/15 + H4575-T N50A/16 + H4575-T Dimensions & Weights of Pump with Water filled Motor Length (mm) Type Pump + Motor ØE = For Single Cable Motor Maximum Diameter of Pump Inclusive of Cable Guard. ØE = For Two Cable Motor Maximum Diameter of Pump Inclusive of Cable Guard Will ØE = Increase by 3mm. Radial Flow 6" Electric Submersible Pump Performance Chart Rp 2½ Pump Type Oil filled Water filled Dimensions & Weights of Pump with Oil filled Motor Type Pump + Motor N60A/6 + H4540-T N60A/7 + H4540-T N60A/8 + H4555-T N60A/9 + H4555-T N60A/10 + H4555-T N60A/11 + H4575-T N60A/12 + H4575-T N60A/13 + H4575-T Dimensions & Weights of Pump with Water filled Motor Length (mm) Type Pump + Motor ØE = For Single Cable Motor Maximum Diameter of Pump Inclusive of Cable Guard. ØE = For Two Cable Motor Maximum Diameter of Pump Inclusive of Cable Guard Will ØE = Increase by 3mm.